Good morning crafters, it's Friday and me again :o) I hope you're all well and enjoyed the lovely weather we had this week. I started with a 6" x 6" card and matted it with black card from my stash. I wanted to use the technique of putting the Brusho's onto the card before spritzing and used the Purple, Yellow and Aqua Marine, I then spritzed the card lightly to see the effect before spritzing again to increase the colour. I then used the Imagination Craft Vine Trellis Stencil and watered down some yellow Brusho onto a tile and sponged through the stencil in various places onto the card. 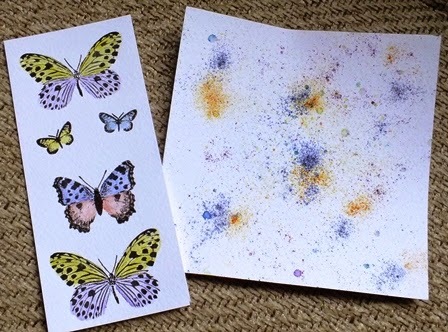 The next step was to stamp my images which I used the Stampendous Butterflies and stamped them onto some watercolour card and dried with a heat gun before colouring in with Water Colour Markers. 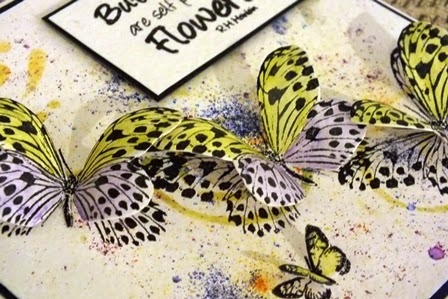 I cut out all the butterflies, and decided where they would go then stamped the images again over the background card. 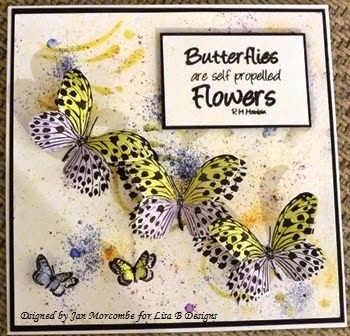 At this stage I decided not to use the blue and red butterfly and instead stamped the yellow and purple butterfly again (see card above) I then used Cosmic Shimmer dries clear glue to place the butterflies over the stamped images on the background. The butterflies looks so real it would be a shame to glitter them! It's a beautiful card, just as it is. Beautiful card Jan, the butterflies look wonderful.